Additional stage depth and masking of technical equipment is achieved by the placement of multiple sets of legs and a border. 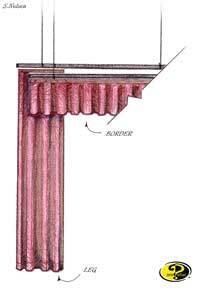 While they serve much the same purpose as the teaser and tormentors, they are usually always of standard drapery construction and are used to reduce or reveal the full width of the proscenium arch as needed to fit each setting. While legs and borders can me manufactured without a lining, for maximum opacity and longevity of drapery it is recommended that they be lined. The lining will help to prevent any damage to the face fabric by set pieces that may come into contact with the back side of the drape. Additionally, a lining will slow the process of the fabric becoming brittle when exposed at close proximity to stage lights. Typical Fabric Choices for legs and borders include Cotton Velour, Encore Velour. For an economy masking drape with reasonable opacity consider 16oz Commando Cloth. Track Recommendations for this type of application include the Silent Steel 280 series and the Besteel 170 Series by ADC. Borders which are not intended to move may be rigged directly to a batten or pipe.